Especially stuff I didn’t know about like this. Coolio! Yay! I know not everyone who reads TMK knows about Norse mythology so I hope this works for everyone. Also, hurray for Coal story time! Beatiful rendition, shows he has the gift of synthesis. Luckily, later in my years I’ve come around more leveled versions of this mith, with very good insights on the meaning of the story, and comparing them, especially with greek and Babylon myths has helped to put them in a structured perspective…sorry for the uncalled wall of text. Thanks again for the comics. Nooo that’s all really interesting! Sadly I’m not quite done with the story here, haha, but I won’t be getting into anything too graphic. Thank you! I adore your stylized, Nordic drawings. This page is just so wonderful with all the little details like Hod’s figure not having any eyes and Coal’s gesture as he shares the story in front of the fire…just fills me with multiple senses: awe, foreboding…and squealing because I’m looking at this as “story-time with Coal”. 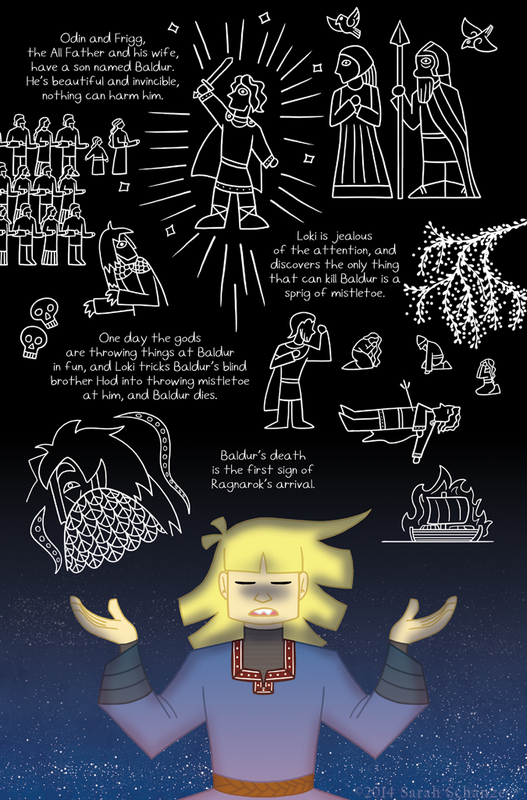 I have no knowledge of Nordic mythology and have been reading your comic with small forays into wikipedia now and then…but this page really has me itching to do some real research and learn about it now! Haha, thank you! A really great book I read that’s a retelling of the mythologies is simply “The Norse Myths” by Kevin Crossley-Holland. Very entertaining and also easy to understand and read. There’s some notes in the back too. We could go into where Sleipnir came from… From our gender bending buddy who decided to be a mare for some ribald mischief to save his own skin and defraud an honest jotun craftsman. Maybe after a few drinking horns. In the “Lokasenna” Loki doesn’t kill Balder, he just starts calling the gods out on all the horrible nasty things they’ve been doing (murder, adultery, etc. ), then he starts Ragnarok later as retaliation for being punished. Try Egyptian; sometimes the gods are relatives, others they’re spouses. Over a bajillion different versions for the exact same myth! I have questions for the characters!! Ibrahim: Do you think your father will pursue your captors for your kidnapping? Coal: why u so mean? That last one. VERY GOOD.